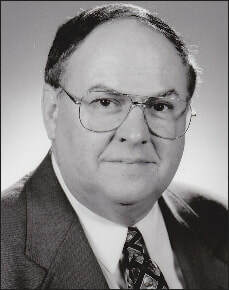 Ted Larson was a popular film professor at Minnesota State University, Moorhead (MSUM). He taught at MSUM from 1968 until his passing in 2000. Ted was best known for his presentations of classic film festivals, seminars and movie series events at colleges, theatres and arts centers throughout the Fargo/Moorhead region. He was named a Distinguished Alumni of MSUM in 1998 for his contributions to students and film studies. He was born in Glyndon, Minnesota and graduated from MSUM (then called "Moorhead State University") in 1962 with Speech/Theatre and English degrees. He also earned a master's degree in Speech & Drama from the University of Kansas. He taught at Benjamin Franklin Junior High School in Fargo, North Dakota for six years before joining the Speech & Theatre Arts faculty at MSUM, where he taught for 32 years. He directed MSUM's International Film Festival and Summer Cinema film series for more than 20 years. He also administered the Colleen Moore Film Scholarship program at the university. Mr. Larson (or "TL" as many of his students affectionately called him) inspired many students to pursue careers in filmmaking and film studies/education. Among them: Dr. Brad Chisholm (Prof. of Film Studies at St. Cloud State University); Dr. Gregory Carlson (Director of Film Studies at Concordia College); Jay Johnson (who worked for David Letterman productions); Jule Selbo (who worked with George Lucas on the Young Indiana Jones Chronicles and the TV series Life Goes On); and Andy Zilch (chosen to work at Warner Bros. studios for Steven Spielberg's production of A.I. Artificial Intelligence). Ted was a long-time member of the Fargo Theatre's board of directors. He was one of the initiators and co-producers of Silent Movie Night, which began in 1974. He was responsible for bringing silent film legends Lillian Gish and Colleen Moore to the Fargo Theatre for special tributes and film screenings. The annual Fargo Film Festival established an award in Ted's honor. The Ted M. Larson Award is given to an individual whose commitment to cinema demonstrates outstanding, longtime contributions to one or more of the following areas: film education, film production, film culture, and film criticism and history.